The brackets are set for the big dance -- the dance around tax responsibility. Most of the teams are in the bottom bracket. In this league, the lowest score wins. The winner? There is no winner. Outside the stadium our nation's kids and seniors and low-income mothers may be dealing with food and housing cuts, but on the corporate playing floor new low-tax records are being set again this year. Just as this is a golden age for sports, this is also, as noted by the New York Times, "a golden age for corporate profits." Corporations have simply stopped paying their taxes, perhaps using the 2008 recession as an excuse to plead hardship, but then never restoring their tax obligations when business got better. The facts are indisputable. For over 20 years, from 1987 to 2008, corporations paid an average of 22.5 percent in federal taxes. Since the recession, this has dropped to 10 percent - even though their profits have doubled in less than ten years. Pay Up Now just completed a compilation of corporate tax payments over the past five years, using SEC data as reported by the companies themselves. The firms chosen are top-earners who have filed 10-K reports through 2012. Their US Tax figures represent the five-year total of "current" payments. The 64 corporate teams paid just over 8 percent in taxes over the five-year period. General Electric: The worst tax record over five years, with $81 billion in profits and a $3 billion refund. Boeing: In addition to receiving a refund despite $21.5 billion in profits, the company ranked high in job cutting, underfunded pensions and contractor misconduct. Exxon Mobil: Made by far the largest profits in the group, but paid less than 1 percent in U.S. taxes, and yet received oil subsidies along with their tax breaks. Unabashedly reports a 2012 "theoretical tax" of over $27 billion, almost 90 percent of its total income tax expense. The company was also near the top in contractor misconduct. Verizon: Second worst tax record, with a refund despite $48 billion in profits. Kraft Foods: Received a refund from the public despite $13.5 billion in profits. Also a leading job-cutter. Citigroup: One of the five big banks who are estimated to get a bailout/refund from the American public amounting to three cents from every tax dollar. Dow Chemical: Received a refund despite almost $10 billion in profits. IBM: Paid less than 3% in taxes while ranking as one of the leading job cutters, and near the top in contractor misconduct. Chevron: In addition to a meager 4.3 percent tax rate and a share of oil subsidies, the company has been the main beneficiary of tax-exempt government bonds. FedEx: The company paid less than 5 percent in federal taxes while relying on the publicly-funded Post Office to deliver thirty percent of its ground packages. Honeywell: Less than 6 percent in taxes, a leading job cutter, near the top in instances of contractor misconduct, and run by the "Fix the Debt" CEO with the largest pension fund. AT&T: An 8 percent tax rate, a leader in job cuts and underfunded pensions, and in the top 20 of contractor misconduct instances. Merck: Notable for an 8.4 percent tax rate, job cuts, offshore holdings, and the top U.S. spot on the contractor misconduct dollar list. Apple: Where to begin? Avoiding federal taxes, avoiding state taxes, hiding overseas earnings, engaging in intellectual property schemes, using the "Double Irish" to transfer profits from Europe to Bermuda, and underpaying its store workers despite conducting most of its product and research development in the United States. Pfizer: One of the leaders in stockpiling untaxed profits overseas, and right behind Merck in contractor misconduct dollars. Google: A master at the "Double Irish" revenue shift to Bermuda tax havens, while using tax loopholes to bring a lot of the money back to the U.S. without paying taxes on it. 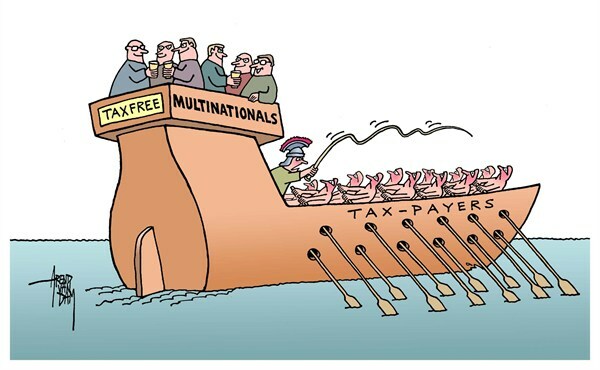 Recognized as one of the world's biggest tax avoiders. Microsoft: Named as one of the biggest offshore hoarders while using tax strategies to bring much of their untaxed money back to the U.S., where it also avoids state taxes. GE, Boeing, Exxon, and Apple. Merck almost crashed the party, but the competition was too stiff. All these companies, after using our infrastructure and technology and research facilities and higher education and national defense to build incomparably successful businesses, are now doing everything in their power to avoid paying anything back, while instead using a carefully manipulated set of "legal" business writeoffs and exemptions and loopholes to cut their tax bills to almost nothing. And all the while they rant about the unfairness of the U.S. tax code. The real madness is that human beings are suffering because of the tax games corporations play.